Studies of the mirror neuron system may reveal clues to the causes of autism and help researchers develop new ways to diagnose and treat the disorder. In the 1940s two physicians--American psychiatrist Leo Kanner and Austrian pediatrician Hans Asperger--independently discovered this developmental disorder, which afflicts about one in 150 American children. By an uncanny coincidence each gave the syndrome the same name: autism, which derives from the Greek word autos, meaning "self." The name is apt, because the most conspicuous feature of the disorder is a withdrawal from social interaction. More recently, doctors have adopted the term "autism spectrum disorder" to make it clear that the illness has many related variants that range widely in severity but share some characteristic symptoms. Ever since autism was identified, researchers have struggled to determine what causes it. Scientists know that susceptibility to autism is inherited, although environmental risk factors also seem to play a role. Starting in the late 1990s, investigators in our laboratory at the University of California, San Diego, set out to explore whether there was a connection between autism and a newly discovered class of nerve cells in the brain called mirror neurons. Because these neurons appeared to be involved in abilities such as empathy and the perception of another individuals intentions, it seemed logical to hypothesize that a dysfunction of the mirror neuron system could result in some of the symptoms of autism. Over the past decade, several studies have provided evidence for this theory. Further investigations of mirror neurons may explain how autism arises, and in the process physicians may develop better ways to diagnose and successfully treat the disorder. Although the chief diagnostic signs of autism are social isolation, lack of eye contact, poor language capacity and absence of empathy, other less well known symptoms are commonly evident. Many people with autism have problems understanding metaphors, sometimes interpreting them literally. They also have difficulty miming other peoples actions. Often they display an eccentric preoccupation with trifles yet ignore important aspects of their environment, especially their social surroundings. Equally puzzling is the fact that they frequently show an extreme aversion to certain sounds that, for no obvious reason, set off alarm bells in their minds. The theories that have been proposed to explain autism can be divided into two groups: anatomical and psychological. (Researchers have rejected a third group of theories--such as the "refrigerator mother" hypothesis--that blame the disorder on poor upbringing.) Eric Courchesne of U.C.S.D. and other anatomists have shown elegantly that children with autism have characteristic abnormalities in the cerebellum, the brain structure responsible for coordinating complex voluntary muscle movements. Although these observations must be taken into account in any final explanation of autism, it would be premature to conclude that damage to the cerebellum is the sole cause of the disorder. Cerebellar damage inflicted by a stroke in a child usually produces tremors, swaying gait and abnormal eye movements--symptoms rarely seen in autism. Also, one does not see any of the symptoms typical of autism in patients with cerebellar disease. It is possible that the cerebellar changes observed in children with autism may be unrelated side effects of abnormal genes whose other effects are the true causes of the disorder. Perhaps the most ingenious of the psychological theories is that of Uta Frith of University College London and Simon Baron-Cohen of the University of Cambridge, who posit that the main abnormality in autism is a deficit in the ability to construct a "theory of other minds." Frith and Baron-Cohen argue that specialized neural circuitry in the brain allows us to create sophisticated hypotheses about the inner workings of other peoples minds. These hypotheses, in turn, enable us to make useful predictions about others behavior. Frith and Baron-Cohen are obviously on the right track, but their theory does not provide a complete explanation for the constellation of seemingly unrelated symptoms of autism. Indeed, saying that people with autism cannot interact socially because they lack a "theory of other minds" does not go very far beyond restating the symptoms. What researchers need to identify are the brain mechanisms whose known functions match those that are disrupted in autism. What surprised Rizzolatti and his co-workers was that a subset of the motor command neurons also fired when the monkey watched another monkey or a researcher perform the same action. For example, a neuron involved in controlling the reach-for-the-peanut action fired when the monkey saw one of his fellows making that movement. Brain-imaging techniques subsequently showed that these so-called mirror neurons also exist in the corresponding regions of the human cortex. These observations implied that mirror neurons--or, more accurately, the networks they are part of--not only send motor commands but also enable both monkeys and humans to determine the intentions of other individuals by mentally simulating their actions. Later research showed that mirror neurons are located in other parts of the human brain, such as the cingulate and insular cortices, and that they may play a role in empathetic emotional responses. While studying the anterior cingulate cortex of awake human subjects, investigators found that certain neurons that typically fire in response to pain also fired when the person saw someone else in pain. Mirror neurons may also be involved in imitation, an ability that appears to exist in rudimentary form in the great apes but is most pronounced in humans. The propensity to imitate must be at least partly innate: Andrew Meltzoff of the University of Washington has shown that if you stick your tongue out at a newborn baby, the infant will do the same. Because the baby cannot see its own tongue, it cannot use visual feedback and error correction to learn the skill. Instead there must be a hardwired mechanism in the childs brain for mapping the mothers visual appearance--whether it be a tongue sticking out or a smile--onto the motor command neurons. Language development in childhood also requires a remapping of sorts between brain areas. To imitate the mothers or fathers words, the childs brain must transform auditory signals in the hearing centers of the brains temporal lobes into verbal output from the motor cortex. Whether mirror neurons are directly involved in this skill is not known, but clearly some analogous process must be going on. Last, mirror neurons may enable humans to see themselves as others see them, which may be an essential ability for self-awareness and introspection. What has all this to do with autism? In the late 1990s our group at U.C.S.D. noted that mirror neurons appear to be performing precisely the same functions that seem to be disrupted in autism. If the mirror neuron system is indeed involved in the interpretation of complex intentions, then a breakdown of this neural circuitry could explain the most striking deficit in people with autism, their lack of social skills. The other cardinal signs of the disorder--absence of empathy, language deficits, poor imitation, and so on--are also the kinds of things you would expect to see if mirror neurons were dysfunctional. Andrew Whitens group at the University of St. Andrews in Scotland made this proposal at about the same time we did, but the first experimental evidence for the hypothesis came from our lab, working in collaboration with Eric L. Altschuler and Jaime A. Pineda of U.C.S.D. To demonstrate mirror neuron dysfunction in children with autism, we needed to find a way to monitor the activity of their nerve cells without putting electrodes in their brains (as Rizzolatti and his colleagues did with their monkeys). We realized that we could do so using an electroencephalogram (EEG) measurement of the childrens brain waves. For more than half a century, scientists have known that an EEG component called the mu wave is blocked anytime a person makes a voluntary muscle movement, such as opening and closing ones hands. Interestingly, this component is also blocked when a person watches someone else perform the same action. One of us (Ramachandran) and Altschuler suggested that mu-wave suppression might provide a simple, noninvasive probe for monitoring mirror neuron activity. We decided to focus our first experiments on a high-functioning child with autism--that is, a child without severe cognitive impairments. (Very young, low-functioning children did not participate in this study because we wanted to confirm that any differences we found were not a result of problems in attention, understanding instructions or the general effects of mental retardation.) The EEG showed that the child had an observable mu wave that was suppressed when he made a simple, voluntary movement, just as in normal children. But when the child watched someone else perform the action, the suppression did not occur. We concluded that the childs motor command system was intact but that his mirror neuron system was deficient. This observation, which we presented at the annual meeting of the Society for Neuroscience in 2000, provided a striking vindication of our hypothesis. One has to be careful, however, of generalizing from a single case, so our lab group later conducted a more systematic series of experiments in 10 high-functioning individuals with autism spectrum disorder and 10 age- and gender-matched control subjects. We saw the expected suppression of mu waves when the control subjects moved their hands and watched videos of a moving hand, but the EEGs of the subjects with autism showed mu suppression only when they moved their own hands. Other researchers have confirmed our results using different techniques for monitoring neural activity. A group led by Riitta Hari of the Helsinki University of Technology found mirror neuron deficits in children with autism by employing magnetoencephalography, which measures the magnetic fields produced by electric currents in the brain. More recently, Mirella Dapretto of the University of California, Los Angeles, and her colleagues have reported similar findings using functional magnetic resonance imaging. Hugo Thoret of the University of Montreal has also found evidence for similar impairments using transcranial magnetic stimulation. Taken together, these findings provide compelling evidence that people with autism have dysfunctional mirror neuron systems. Scientists do not yet know which genetic and environmental risk factors can prevent the development of mirror neurons or alter their function, but many research groups are now actively pursuing the hypothesis because it predicts symptoms that are unique to autism. In addition to explaining the primary signs of autism, deficiencies in the mirror neuron system can also account for some of the less well known symptoms. For instance, researchers have long known that children with autism often have problems interpreting proverbs and metaphors. When we told one of our subjects to" get a grip on yourself," he took the message literally and started grabbing his own body. Though seen in only a subset of children with autism, this difficulty with metaphors cries out for an explanation. Understanding metaphors requires the ability to extract a common denominator from superficially dissimilar entities. Consider the bouba/kiki effect, which was discovered by German-American psychologist Wolfgang Koehler more than 60 years ago. In this test, a researcher displays two crudely drawn shapes, one jagged and one curvy, to an audience and asks, "Which of these shapes is bouba and which is kiki?" No matter what languages the respondents speak, 98 percent will pick the curvy shape as bouba and the jagged one as kiki. This result suggests that the human brain is somehow able to extract abstract properties from the shapes and sounds--for example, the property of jaggedness embodied in both the pointy drawing and the harsh sound of kiki. We conjectured that this type of cross-domain mapping is analogous to metaphors and must surely involve neural circuits similar to those in the mirror neuron system. Consistent with this speculation, we discovered that children with autism perform poorly at the bouba/kiki test. But which part of the human brain is involved in this skill? The angular gyrus, which sits at the crossroads of the brains vision, hearing and touch centers, seemed to be a likely candidate--not only because it is strategically located but because nerve cells with mirror neuronlike properties have been identified there. When we studied nonautistic subjects with damage to this area of the brain, we found that many of them fail the bouba/kiki test and have a disproportionate difficulty understanding metaphors, just like people with autism. These results suggest that cross-domain mapping may have originally developed to aid primates in complex motor tasks such as grasping tree branches (which requires the rapid assimilation of visual, auditory and touch information) but eventually evolved into an ability to create metaphors. Mirror neurons allowed humans to reach for the stars, instead of mere peanuts. Can the Mirrors Be Repaired? The discovery of mirror neuron deficiencies in people with autism opens up new approaches to diagnosing and treating the disorder. For example, physicians could use the lack of mu-wave suppression (or perhaps the failure to mimic a mother sticking out her tongue) as a diagnostic tool to identify children with autism in early infancy, so that the currently available behavioral therapies can be started as quickly as possible. Timely intervention is critical; the behavioral therapies are much less effective if begun after autisms main symptoms appear (typically between ages two and four). An even more intriguing possibility would be to use biofeedback to treat autism or at least alleviate its symptoms. Doctors could monitor the mu waves of a child with autism and display them on a screen in front of the patient. If the childs mirror neuron functions are dormant rather than completely lost, it may be possible for him or her to revive this ability by learning--through trial and error and visual feedback--how to suppress the mu waves on the screen. Our colleague Pineda is pursuing this approach, and his preliminary results look promising. Another novel therapeutic approach might rely on correcting chemical imbalances that disable the mirror neurons in individuals with autism. Our group (including students Mikhi Horvath and Mary Vertinski) has suggested that specialized neuromodulators may enhance the activity of mirror neurons involved in emotional responses. According to this hypothesis, the partial depletion of such chemicals could explain the lack of emotional empathy seen in autism, and therefore researchers should look for compounds that stimulate the release of the neuromodulators or mimic their effects on mirror neurons. One candidate for investigation is MDMA, better known as ecstasy, which has been shown to foster emotional closeness and communication. It is possible that researchers may be able to modify the compound to develop a safe, effective treatment that could alleviate at least some of autisms symptoms. Another candidate is prolactin, a hormone known to promote social affiliation in animal studies. We are also developing an experimental treatment using mirrors. A child with autism would be taught to reach for a toy hidden under a table, guided only by the mirror reflection of his or her hand and the toy. The perfect synchrony between the childs own motor commands and the movements of the other child in the mirror might provide "double dose" stimulation to help revive dormant mirror neurons. Such treatments, however, may offer only partial relief, because other symptoms of autism cannot be explained by the mirror neuron hypothesis--for example, repetitive motions such as rocking to and fro, avoidance of eye contact, hypersensitivity, and aversion to certain sounds. In an attempt to determine how these secondary symptoms might arise, our lab group (in collaboration with William Hirstein of Elmhurst College and Portia Iversen of Cure Autism Now, a nonprofit foundation based in Los Angeles) has developed what we call the salience landscape theory. When a person looks at the world, he or she is confronted with an overwhelming amount of sensory information--sights, sounds, smells, and so on. After being processed in the brains sensory areas, the information is relayed to the amygdala, which acts as a portal to the emotion-regulating limbic system. Using input from the individuals stored knowledge, the amygdala determines how the person should respond emotionally--for example, with fear (at the sight of a burglar), lust (on seeing a lover) or indifference (when facing something trivial). Messages cascade from the amygdala to the rest of the limbic system and eventually reach the autonomic nervous system, which prepares the body for action. If the person is confronting a burglar, for example, his heart rate will rise and his body will sweat to dissipate the heat from muscular exertion. The autonomic arousal, in turn, feeds back into the brain, amplifying the emotional response. Over time, the amygdala creates a salience landscape, a map that details the emotional significance of everything in the individuals environment. Our group decided to explore the possibility that children with autism have a distorted salience landscape, perhaps because of altered connections between the cortical areas that process sensory input and the amygdala or between the limbic structures and the frontal lobes that regulate the resulting behavior. As a result of these abnormal connections, any trivial event or object could set off an extreme emotional response--an autonomic storm--in the childs mind. This hypothesis would explain why children with autism tend to avoid eye contact and any other novel sensation that might trigger an upheaval. The distorted perceptions of emotional significance might also explain why many children with autism become intensely preoccupied with trifles such as train schedules while expressing no interest at all in things that most children find fascinating. We found some support for our hypothesis when we monitored autonomic responses in a group of 37 children with autism by measuring the increase in their skin conductance caused by sweating. In contrast with the control subjects, the children with autism had a higher overall level of autonomic arousal. Although they became agitated when exposed to trivial objects and events, they often ignored stimuli that triggered expected responses in the control group. But how could a childs salience landscape become so distorted? Investigators have found that nearly one third of children with autism have had temporal lobe epilepsy in infancy, and the proportion may be much higher given that many epileptic seizures go undetected. Caused by repeated random volleys of nerve impulses traversing the limbic system, these seizures could eventually scramble the connections between the visual cortex and the amygdala, indiscriminately enhancing some links and diminishing others. In adults, temporal lobe epilepsy results in florid emotional disturbances but does not radically affect cognition; in infants, however, the seizures may lead to a more profound disability. And, like autism, the risk of temporal lobe epilepsy in infancy appears to be influenced by both genetic and environmental factors. Some genes, for example, could make a child more susceptible to viral infections, which could in turn predispose the child to seizures. The salience landscape theory could also provide an explanation for the repetitive motions and head banging seen in children with autism: this behavior, called self-stimulation, may somehow damp the childs autonomic storms. Our studies found that self-stimulation not only had a calming effect but also led to a measurable reduction in skin conductance. Hirstein is now developing a portable device that could monitor an autistic childs skin conductance; when the device detects autonomic arousal, it could turn on another device, called a squeeze vest, that provides a comforting pressure by gently tightening around the childs body. Our two candidate theories for explaining the symptoms of autism--mirror neuron dysfunction and distorted salience landscape--are not necessarily contradictory. 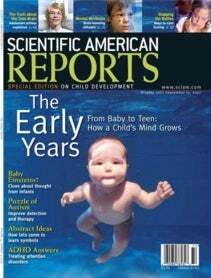 It is possible that the same event that distorts a childs salience landscape--the scrambled connections between the limbic system and the rest of the brain--also damages the mirror neurons. Alternatively, the altered limbic connections could be a side effect of the same genes that trigger the dysfunctions in the mirror neuron system. Further experiments are needed to rigorously test these conjectures. The ultimate cause of autism remains to be discovered. In the meantime, our speculations may provide a useful framework for future research. VILAYANUR S. RAMACHANDRAN and LINDSAY M. OBERMAN have investigated the links between autism and the mirror neuron system at the Center for Brain and Cognition at the University of California, San Diego. Ramachandran, director of the center, earned his Ph.D. in neuroscience from the University of Cambridge. A renowned expert on brain abnormalities, he has also studied the phenomena of phantom limbs and synesthesia, for which he won the 2005 Henry Dale Prize and a lifetime fellowship from the Royal Institution of Great Britain. Oberman is a graduate student in Ramachandrans laboratory at U.C.S.D., joining the group in 2002. Autonomic Responses of Autistic Children to People and Objects. William Hirstein, Portia Iversen and Vilayanur S. Ramachandran in Proceedings of the Royal Society of London B, Vol. 268, pages 18831888; 2001. EEG Evidence for Mirror Neuron Dysfunction in Autism Spectrum Disorders. Lindsay M. Oberman, Edward M. Hubbard, Joseph P. McCleery, Eric L. Altschuler, Jaime A. Pineda and Vilayanur S. Ramachandran in Cognitive Brain Research, Vol. 24, pages 190198; 2005. A Brief Tour of Human Consciousness. New edition. Vilayanur S. Ramachandran. Pi Press, 2005.